I dabbled in Obj-C two years ago and mean to get back to it this summer. Just finished teaching a course in software development and for the course project, one of my student asked if he could develop it for his iphone (he seems to do a lot of development in iOS) instead of Java; I said okay. 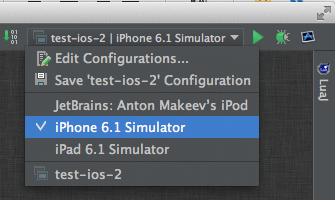 I get his project and tested it in xcode, ran correctly. In the meantime, I was searching for comments on xcode and discovered AppCode. I got the trial version and tried running his app on it. 2013-05-07 09:54:46.758 xcodebuild[5192:707] WARNING: skipping plug-in at path '/Users/xxxxxx/Library/Application Support/Developer/Shared/Xcode/Plug-ins/XcodeAutoAssistant.pbplugin' because it is not compatible with this version of Xcode. I have the latest xcode installed, no additional apps except AppCode. I don't understand why something is not compatible with "this version of Xcode" - is the problem with AppCode? Any input would be appreciated. I searched for error 65, but turned up a lot of posts here that seem generic or relate to many different types of problems. Thanks, that worked. Now to crack open the Xcode book and do more learning!